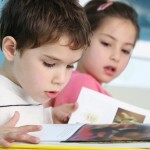 What will my child learn at Eager Readers? Phonological awareness – Phonological awareness is the basis for phonics—it is the awareness that spoken language is made up of a variety of sounds. This includes many things, such as the awareness of: rhyming words, alliteration (words that start with the same sound), syllables, and that spoken sentences are made up of words, which are in turn made up of individual sounds. When talking about individual sounds of language, we use the term phonemic awareness. Phonological awareness is the best single predictor of becoming a successful reader and speller, more accurate than the variables of intelligence, vocabulary, and socio-economic status. Phonics – Phonics is the understanding of the relationship between sounds of spoken language and our written alphabet. The application of phonics is necessary for reading and spelling. Concepts about print – “Concepts about print” (CAP) is a term referring to a range of things that children need to understand about how printed language works. Some examples of CAP are knowing: that books are organised in a particular way, with a cover, title, author, illustrator; that we read from left to right and top to bottom and front to back; that printed language consists of letters, which make words, which make sentences, which are separated by spaces; that sentences begin with capital letters; and the list goes on. Successful beginning readers start developing these concepts early, well before school starts. Reading comprehension & Vocabulary Development – Although it may seem obvious, reading comprehension is always the goal of reading. It is not enough to simply read the words on a page, we need to ensure that children are comprehending what they read (or what we read to them) by asking questions to clarify their understanding. This helps build our children’s vocabulary. Whether someone understands something they read, or not, is related to both their life experience and their vocabulary. (Consider how difficult it would be to read a medical journal if one were not a doctor!) Therefore it’s important that the type of books children read is both interesting and comprehensible to them. Reading strategies – Effective readers do not rely solely on ‘sounding out’ when reading. Even beginning readers have an assortment of strategies to choose from. The primary strategy is to use the picture to predict what the unknown word might be; as they learn more about letter sounds, they can then use the letters of the word to check if their guess was right or not. Many beginning reading books use the same pattern of language on each page, such as “I have a [cat]. I have a [dog].” etc. Using an introduced language pattern, such as this, is another strategy. As readers become more experienced, they monitor their reading for errors and will use the strategy of starting a sentence over again to use context to figure out new words. Sight words – There are many words that we use frequently in the English language, and many of these are not phonetic, such as the, you, they, of. In order to be a fluent reader, children must learn to recognise these words instantly, by sight. (Sight words are also referred to as “high-frequency words”.) There are two lists that provide teachers with these words. The first was created in the early 1900s, called the Dolch list; it contains 220 words that make up 50% to 75% of what we read. The second is an updated, more comprehensive list; it contains 1,000 words that make up about 90% of what we read. 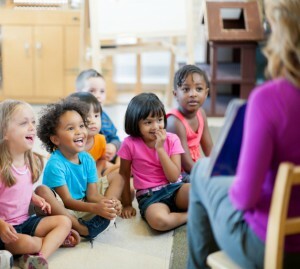 ESL (English as a Second Language) – Eager Readers also offers special classes for children who do not speak English at home. We aim to improve their English and make them more confident in the classroom. In the ESL module we work on: listening comprehension, vocabulary development, and speaking and grammar. Although other aspects of literacy are taught, speaking and understanding English are the primary goals of this module. As you can see, becoming literate involves a whole range of skills, most of which need to be explicitly taught.